Soak both the rice, dhal and fenugreek seeds separately in water for about 6 to 8 hours. Wash and grind rice and dhal separately to a fine paste. Mix together with salt and make a thick batter. Leave it for atleast 8 hours to ferment. Heat tawa. Wipe it with oil. Mix the batter and add little water and make it slightly thinner than the idli batter. Pour one big ladle of batter in the tawa and slightly spread it. It should be thicker than the dosa. Pour a teaspoon of oil around the corners. After it cooked oneside, flip it over and cook other side also. This is plain oothappam. You can chop one big onion, two green chillies, a few curry leaves and coriander leaves, one firm tomato into fine pieces. After pouring the batter on tava, sprinkle these on top and cook covered with a lid. Then remove the lid and flip it over and cook without lid. You can also sprinkle carrot gratings or any vegetable pieces like cabbage, cucumber etc. 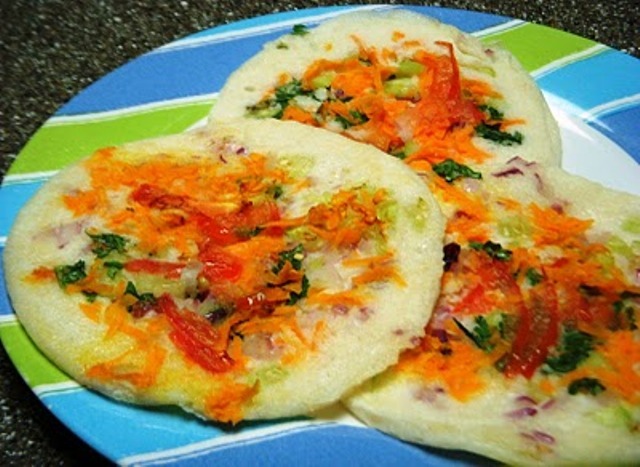 Serve with Coconut Chutney and Sambar. Parboiled rice is nothing but “Puzhungal Arisi” (புழுங்கல் அரிசி) also known as “Idli Arisi” which is available in shops. It is not half cooked rice. The paddy (நெல்) is soaked in water and then cooked in large pots. Then the half cooked paddy is dried in sun and afterwards the outer cover is removed in Rice Mill and the rice is separated. This rice is called “Parboiled Rice”. So, you can buy Idli Rice in the shops and make Idli/Dosa. Could you please let me know what is raw rice? is it idli rice? It is not idli rice. Raw is the rice we use for cooking and it is called “Pacha Arisi” in Tamil.